So it’s not huge progress, but it’s progress. And the best part is that I got over that initial emotional/mental hurdle that was keeping me from getting started. That overwhelming sense of dread is gone. Now it’s just been whittled down (at least in my mind, where the real battle was) to an annoying task that needs to be done. I just keep picturing what this room is going to look like when it’s finished, and that is a great motivation for me. I’m so excited to see how it will turn out. So far, these are the two images I’ve saved as inspiration for my studio. 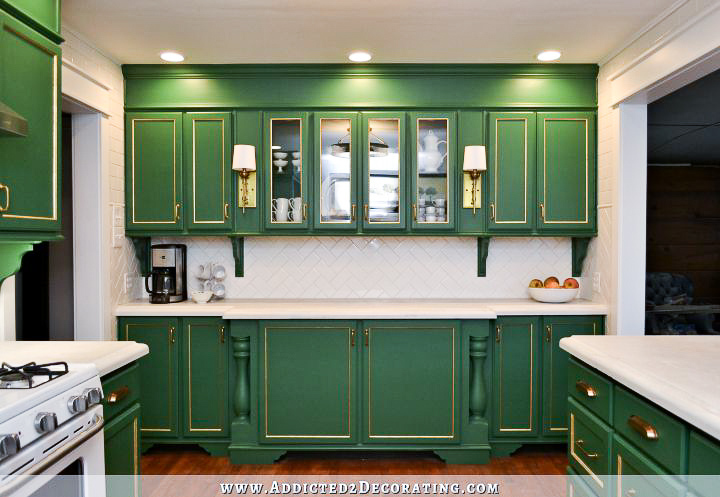 Y’all know I don’t like a distressed finish on cabinets or furniture, but I do love the overall look of that green and white. And those green pendant lights are amazing! Can you image a bold green in the back entry and on my cabinets with my wallpaper? I think it would look amazing! But I didn’t repaint my kitchen because I didn’t like the green. In fact, I loved the green. I repainted the kitchen because I found such a bold color very difficult to decorate around, especially considering that basically all of my decorating decisions in almost every other room (breakfast room, pantry, living room/entryway, music room, hallway, hallway bathroom) needed to “flow” with a bold green kitchen. I finally decided that if I had to make every room in my house “flow” with the kitchen at the center, then the kitchen needed to be my favorite color. But I’ve kind of reached my teal limit now, and green is a close second for me as far as favorite colors go. And since the studio doesn’t have to “flow” with seven other areas/rooms of the house, I think this is my opportunity to bring it back. I just need to make sure that the small bit of cabinets that can be seen from the kitchen and breakfast room doesn’t clash with those rooms, but I don’t think that will be a problem. I mean, just take another look at my pantry backsplash tiles. They have a very similar green in them. 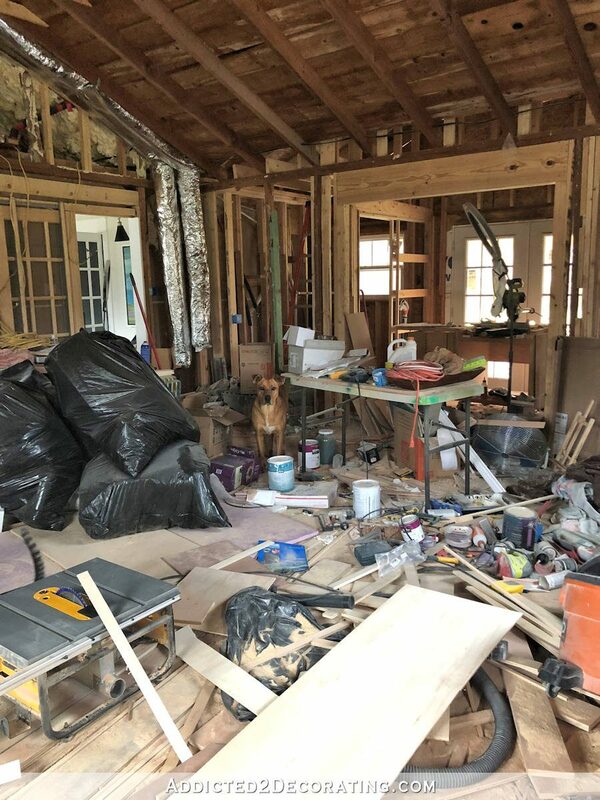 So those were the visions dancing around in my head yesterday as I waded through the mess and cleared out some of the junk. And those will be the visions that keep me going today as well. It’s still a long way away, but I can’t wait to get to the pretty stuff! Also, Cooper looks like he’s put on some healthy weight! He’s super cute! YAY!!!!! I have been patiently waiting for you to start on this space! I didn’t want to say anything as you re-did the bathroom, because I figured it was kind of a stalling technique – I do that, too. But now you are finally here! Let’s do this!! We’ll follow along and cheer you on, and you show us the way! Women power!! Any progress is good. The getting started is the hardest. I’m with you girl. 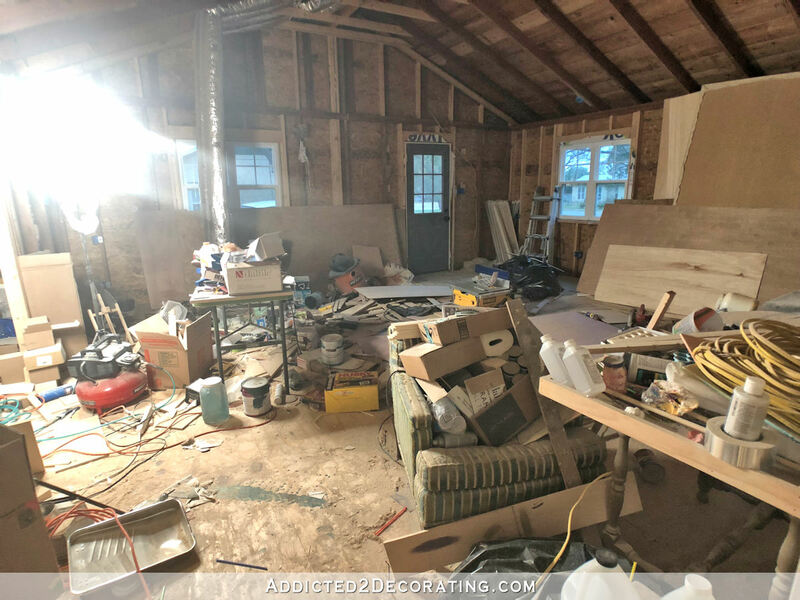 Just a thought, though, about your finished room: You said you would do all your cutting, painting, etc. work in the carport. What about winter time? I think I remember somewhere back there you said something about building a workshop out back. That would be great. Because I’m really worried about your workroom turning into what it is now even after you decorated. Just speaking from knowing what I would do when it’s cold outside! You amaze me every post, so just keep on following your gut. But having accountability is absolutely the best thing. It’s more like GUILT, which I’m more familiar with than accountability. You’re doing better than me as I have 2 storage spaces I’ve been putting off for two years!!! You already inspired me! Today I decided that I will sort through at least one drawer/box/shelf/closet each day. I love the feeling of lightness that I get when I am able to get rid of or organize the stuff that accumulates when I’m not paying attention! Way to go Kristi! Even cleaning can be liberating! Can’t wait to see you do this room! Ok! So, first off, I am very happy that you have started on this. You said in your 2019 goals post that the studio, 1/2 bath, closet , and mudroom are your MAIN GOAL for 2019. So, it’s high time you started on it! Yay for accountability. But, I have a thought on your inspiration and I apologize if is a downer. I’m sorry! Feel free to completely ignore me, as obviously I’m not in your house. As I look at your inspiration photos and your wallpaper it seems like the greens aren’t going to marry up well. The inspiration photos have greens with strong blue undertones, more blue than the green that you used in your kitchen initially and more than what I see in the greens in your wallpaper. So, that worries me for 2 reasons: 1) the amount of teal that you have in your house, and 2) that your result won’t line up with your inspiration. Maybe it’s my computer screen, but it just isn’t fitting in my mind’s eye. I’m sure you’ll figure it all out, but that’s what jumped out to me. Can’t wait for you to work on this. It’s going to be such a huge transformation! I thought that also. I like the wallpaper. Quite a bit. But the green you are leaning to doesn’t appear to blend, or even coordinate, at all. Sort of ‘this shade of green’ because I want it back. Which, if that’s the goal, I know you will make it work. And if it doesn’t, it’s just paint. Well, I thought that also. But knowing Kristi, it’s an inspiration, a starting point, not the final reveal. She’ll get the right green in the end. And there’s nothing like being in the actual room to see the real deal. Our monitors (and eyes) can be very different. I was so hoping you’d go the pink way in decorating the studio. That initial jumping-off point is the hardest! You did good yesterday. BTW, I LOVED your green kitchen. Keep up the good work! I’m just itching to jump on a plane, show up at your house and say “let’s do this! “. However, don’t leave the porch light on for me…I won’t be there. I’m stuck here in caregiver purgatory for the duration. Your posts get me through the day…and I can’t wait to see the studio take form! Just taking the trash out is always a great first step. I love dump runs. Easy thing to check off the list even if it’s the first of many! Yay! I read this as I head to my “office” (dumping ground). I have a couple of small projects and a whole lot of clearing out of stuff I brought home when I retired last year. I got a start yesterday, and now to get back to it! I know we both will get it done! 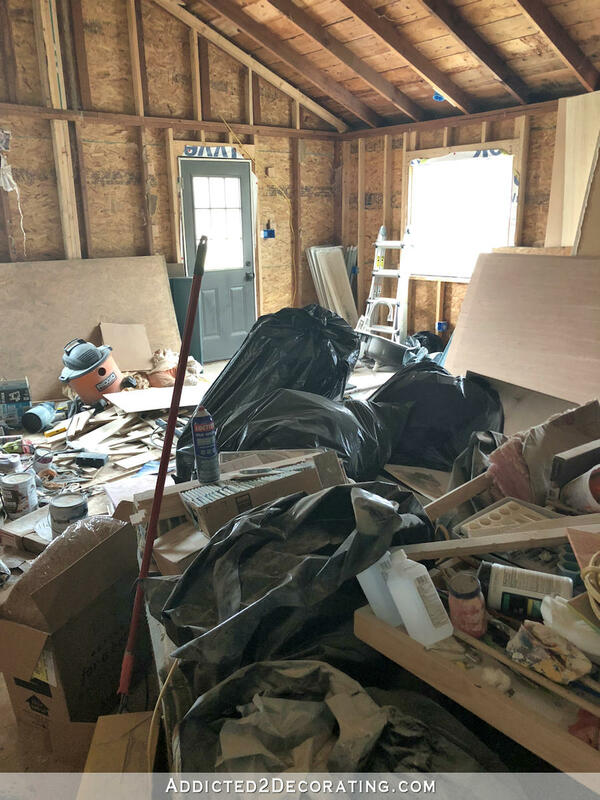 I have found that when I have huge messes like that to clean up it works for me to 1:put away all the tools 2:put away or discard all the paint 3: sort or discard wood 4: other …. Good luck. Eat that elephant! you do exactly what I do – find a way to clear out some walkways first. Then the rest seems so much less intimidating and more manageable. Fantastic progress in such a short time. Love it. Only thing about green in a studio is the light bounces off of it funny and changes the color of things. Tried it and had to go to a neutral. I am SO EXCITED to see that beautiful bold green again. I was so sad when you redid the kitchen. I have a lot of teal in my house because it’s such a pretty calming accent color that seems to go with just about everything, but a beautiful bold kelly green is my absolute favorite color. I’ve never decorated in my home with that, because I’ve always been afraid of how bold it is, but I am currently re-decorating my guest/craft room and I’ve been trying to get the nerve up to do some bold black and white stripes with kelly green accents. I can’t wait to see what you do so I can have some inspiration…because at the rate I’m going, we may be doing the green at the same time!! Black and white striped walls, and a kelly green vanity! PLEASE! And then send me pictures!! 😀 That color combo is one of my all time favorites. Mine too! I’m so scared though since most of my house is gray and teal that it’s going to look odd, but it’s an upstairs room that mostly only I will be in (and guests of course), so it’s not like you can see Kelly Green from my front door clashing with all the teal. I wanted to do black and white striped upper walls and white wainscoting in my half bath with kelly green and gold accents, but my hubby vetoed that. But, since this will be MY craft room, I’m thinking of going for it. If it happens, I’ll be sure to send you pics! I’ve been out of the loop for a bit……. as always, i love everything you do. Your vision amazes me. Cooper looks GREAT!! So happy to see his more “robust” self. This may have one of the largest return on investments for you, if you create an organized space out there like you did in your pantry, all your supplies and tools will have a place to live. When it’s all messy after a project, it will just be a matter of returning items to their places and wiping down the floors and surfaces. It will be such a HUGE win for you. I know being messy is part of your process but it’s going to be better for your overall mental health to have a place for your project items. Good for you!!! Beautiful green entry! Love that color! How does one sign up for your Keto blog? Go with the green, girl. I think its the perfect place for it (I, too, love green). 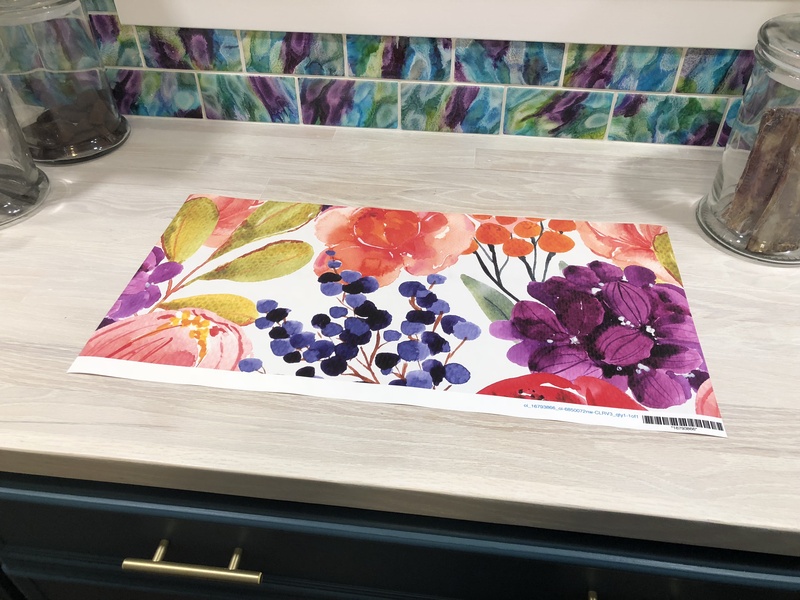 Hey, I paged down after reading today’s entry to the bottom where it shows photos of your other projects, it just so happened that a photo of your new bathroom makeover with the great shower curtain was next to the photo of your kitchen when it was green. Wow, that fabric looks fantastic next to the green of the cabinets. Well, at least in the photos. Just had to comment in case you decide to use the fabric, or something similar, in another area. So where is the dang dog in the first photo??? I admit it…I spent WAY too long looking for that cute face! I have been in a funk for weeks now – need to start something! Thanks for the inspiration! Have you ever watched videos by April Wilkerson? 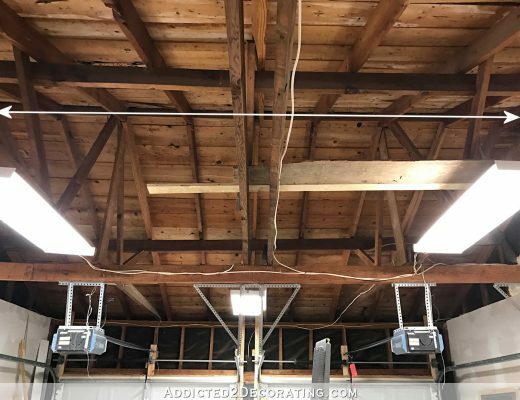 Granted, she is building a workshop and not a studio, but she has some great ideas for tool organization, french cleat hanging systems, etc. I think you are just trying to tidy up after this latest project, but her videos may give you some ideas if you need them for woodworking type organization later on. Thank you for posting your blog. It is so much fun, as well as so inspirational to follow you! I’ll check it out! I’ve never heard of her. OOh sounds so exciting – keep the prize in your mind and keep going 🙂 If it is half as good as the pantry it will be stunning. And you will get to work in there!!! OMG – I just scanned the case studies and BEG you not to respond for so many reasons… This woman is not an expert. She is trying to promote her agenda by discrediting others, you, Dr. Berg and probably many others in other posts. I feel by responding you will validate her in some way. Additionally, you barely made mention of your Keto story and she glommed (sp) on to it. Your health journey is just that, YOURS! So on to much more fun stuff. You are inspiring me to be accountable. I have a sewing/guest room which is a disaster. Thanks to Marie Kondo I started purging with gratitude (LOL- but it works) and cleaning it last weekend and will continue the process this weekend. I had a somewhat similar response to the woman’s comments on the new blog. Call me cynical, but my first thought was that this blogger hopes to drive traffic to her (I assume much smaller, less successful) blog by tapping into Kristi’s readers. Years ago I visited a home your where they had painted the bathroom emerald green, walls, trim, and ceiling. I went home and did the same to my hall bathroom, and it was a major fail. Everyone’s skin tone had a greenish cast like the Wicked Witch in the Wizard of Oz! Needless to say, I repainted asap, lol! 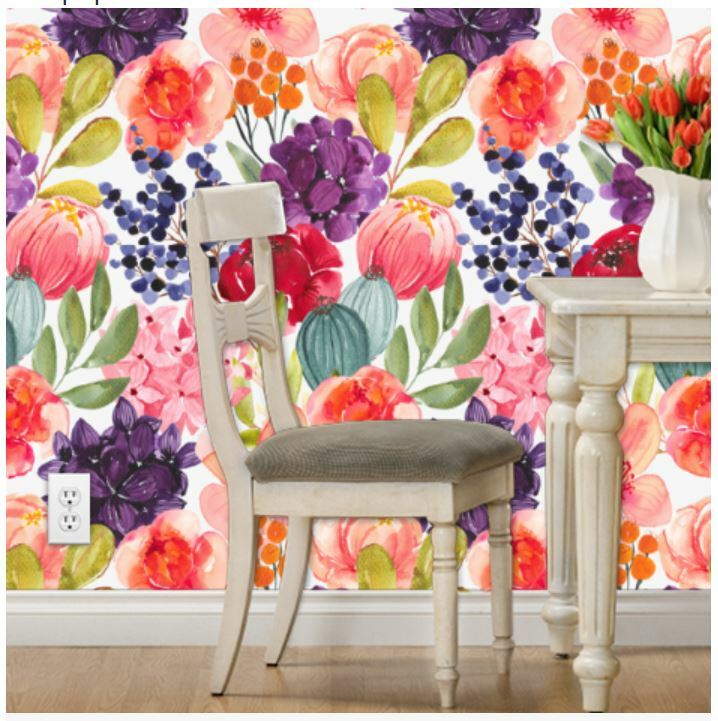 The wallpaper you designed is stunning, and will give your studio positive zing! I love it and hope it works out. Sometimes I think we stall on a project because our unconscious mind knows that something should be reworked and our conscious mind is still committed to a certain plan. Be open to switching things – just like you did in the hall bathroom. That worked out beautifully. Cooper is looking so good these days. He’s obviously thriving with you. What a happy boy. What an amazing difference a couple of hours has made already to your studio space. I love the accountability idea. I’m a list girl, myself and I love being able to cross things off. I can’t wait to see what you do with the greens. We are moving into a rental with a green basin, a shower with shades of green tiles in the shower and a green bathtub. I just don’t seem to have much luck with white bathrooms. Our bathroom has a lot of 1920s decor and it’s actually all in surprisingly good condition. Clearly fate wants me to play with colour. So I’m very keen to see what inspiration you come up with. I love love love the coral vanity in your small bathroom. It really pops now. You were spot on about the grey. It just made the vanity fade into the background. I’m sure I’ll eventually have a storage shed, as well as a workshop out back behind the carport. Ooooh, I’m excited to see how you incorporate green again! I so miss your gorgeous green kitchen. I am so tired of winter and so I am excited to watch you bring spring to us with your beautiful wallpaper and bright bold colors. Thank you Kristi for a breath of fresh air! I have never been able to get behind the gray wall craze because I live where the skies are gray 66% of the time! I love that Kristi uses so much color! It gives me courage. Pearl- I live in Seattle so I agree with you about grey walls when you live under grey skies. Kristi’s beautiful bold colors bring me joy on these gloomy days. Hey you did good, you got a head start on it! You will have this done in no time, and your creativity is amazing! 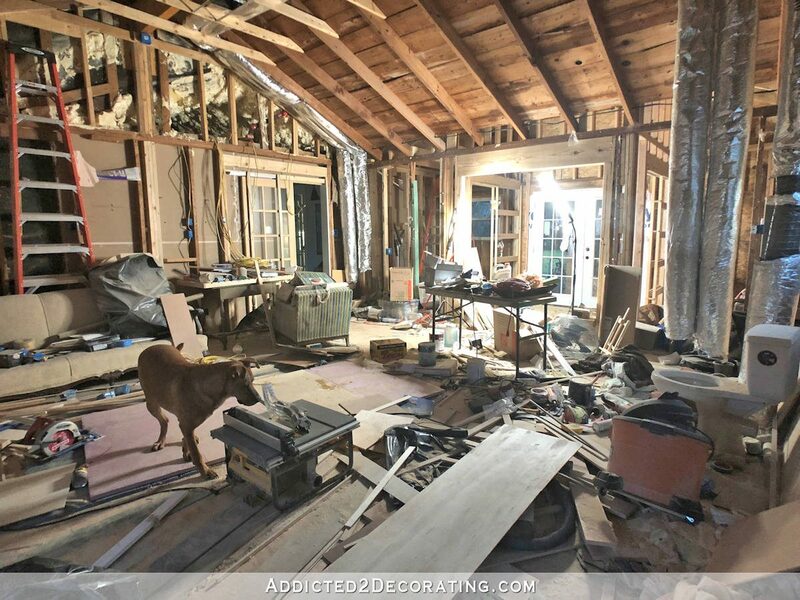 Speaking of “where’s waldo?”, is that a kitty tail I spy in that same Cooper picture to the left by that saw??? I think I see the whole kitty in the second pic. Under the table right above Cooper’s head😂. Ooh–excited to see the green coming back! And good job making a start on the cleaning–two hours of heavy lifting/sorting is big! Especially mentally. Where does Matt enter and exit the house while the studio doors are blocked? I love that color of green, I use it in my house. 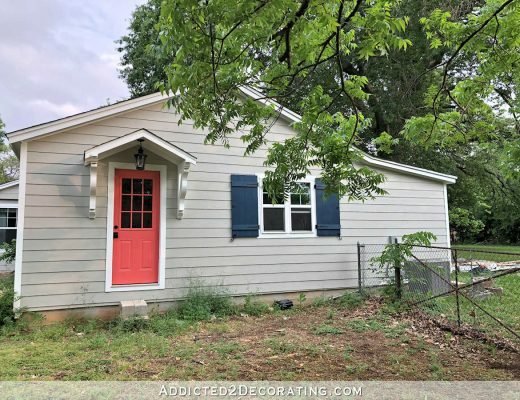 I’m sure I’ll love your cabinets painted that color, but I’m still really hoping for purple. You did indeed make progress and I’m sure over the weekend you added even more. Everyone has times like this – you’re working on multiple projects in an area and before you know it you are up to your neck in ‘stuff’. Think of this as the end of completing 2 projects (pantry and guest bathroom) and your thinking time (while you put away) for your next phase. I cleaned my craft room last week, during the polar vortex and it felt so good to clean up, get rid of, share things and think about projects (one of which I completed) to be done. Where are you? Where is the keeping it real Kristi? Looking forward to a status update…regardless of the level of progress. What is the next step you can take to move you closer to your goal in this amazing Studio?….anything! 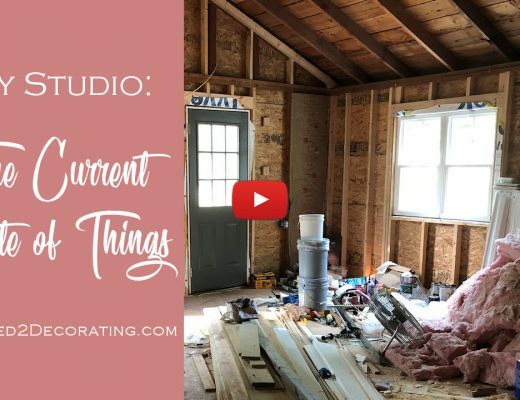 How is the progress on your studio going? Let us know, either way. I’m so glad you don’t have that pop up video anymore. The redesign or whatever you did here is so much better!